SPFX debate split into new thread. A VP faceplate would be a valuable addition to my collection! So definately a demand from my side. To have a VP would be a great addition to my collection. I always wanted something with more lineage than I've got now. I would be in on a faceplate and a helmet if ever available. I'd be interested in a VP if the situation were to arise. Ditto. I would be interested if this were to come to fruition. Time to make another vp run with the dome again. The tampered efx legend faceplate doesn't measure up to a vp face with the exception of the shorter neckline. Funny thing is both have been cleaned up and yet the vp appears more authentic especially concerning the eyes (gunmetal side). I wonder why..... 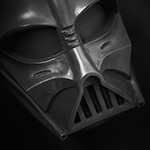 I thought my vader venture was over hoping the actual efx prototype would land in our hands. Nooooo. We get the structurally altered version as plain as daylight. But enough of this efx crap, I'd be seriously interested in purchasing the vp with dome if the opportunity should arrise. The VP has been cleaned up less than the eFX. Here's an old photo of the VP ANH first pull I used to have and I put the GH ANH master dome on it. But keep in mind that the VP dome as it was with the VP is a ROTJ dome, not ANH. So that wouldn't really help too much. The VP ANH, though, is still a very nice mask...my next favorite after the TD/SL/TM. Nice pic. I use to beliieve the GH dome had that sort of "conehead" look to it but it does indeed resemble the EFX dome in many ways. Especially the one side of the M brow thats overly filled in....... Kinda like the EFX . Anybody know if the VP dome is a untouched authentic ROTJ or just another mod ? It is I believe from a copy of an authentic ROTJ dome, not directly from an original. So it isn't a rework or mod, it is a real ROTJ dome. The GH dome was actually the standard for many years (apart from the DJ ANH), it's main failing being extensive clean up and slight rework of Vader's right eyebrow. Yes it was a beautiful mask and I regret letting it go at the time. But it was the smallest of the authentic castings out there, so it came from later down the pipeline (but still from something that was from an ANH "UK mask" lineage, just later). Here it is compared with the TD ANH mask where the size difference is most evident. It actually had a lot more in common with the TD ANH than other castings I've seen. Notice how this photo from my post years back is still here? That's because I have continued to pay for my original webhost since years back to help maintain these photos on the Prop Den and the RPF and which is why I still have many images on that host to post when I need to for threads like this. Still on my list to get but pretty impossible to get i copy after all that years i guess.